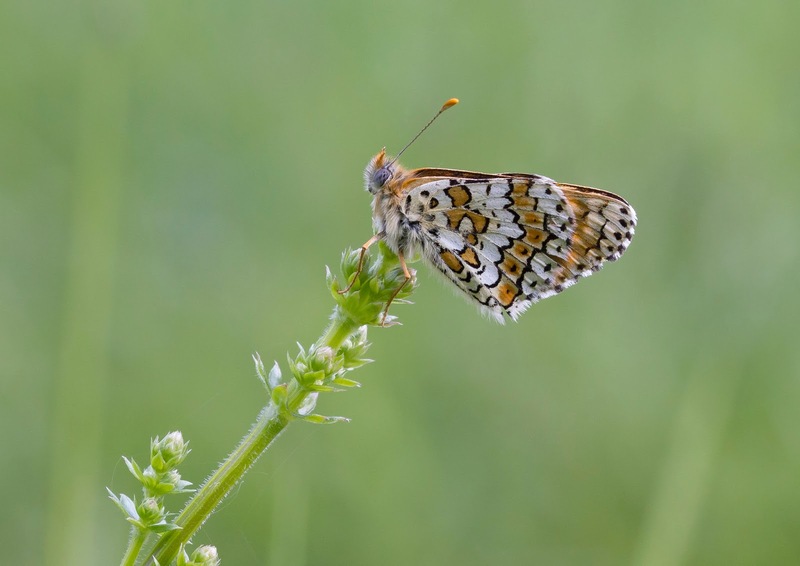 A strange title for a blog post written by someone who is a lover our of Country's butterflies I know but ever since I read it it's been in my mind and in some ways is strangely accurate. It was written by Morris Harris in his book The Aurelian in 1766 and is describing the court case regarding the contested Will of an Eleanor Glanville who was a C17th lepidopterist. Her family used the fact that she was obsessed with butterflies as evidence of her lunacy after her death in order to get her Will changed more in their favour. The attitude towards lepidopterists at the time was evidently one of suspicion, the judge found in the family's favour and poor Eleanor Glanville's reputation was left tarnished as a lunatic. Unfortunately though this doesn't seem to be an attitude that has been left in the C17th century and it still exists today in various forms. 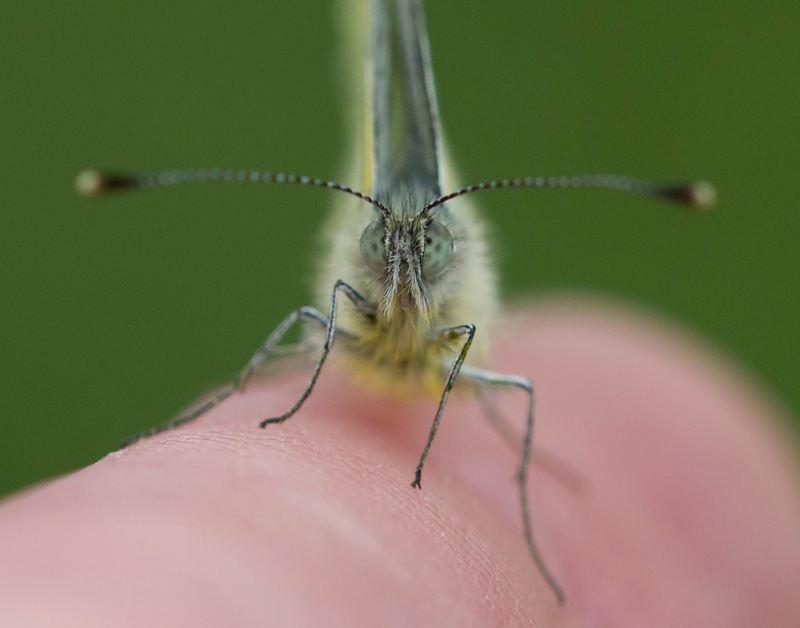 Indeed a few times me and my mates have sometimes looked at each other thinking we must be a little mad for doing what we do (normally while chasing a Clouded Yellow up and down in mid summer heat for a shot!) and you certainly meet some eccentric and interesting characters while you're out and about. 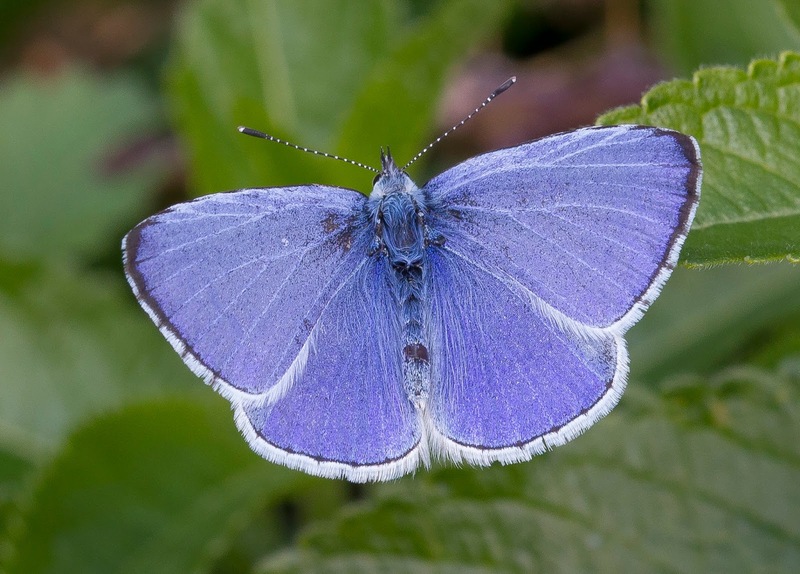 More seriously though it is also an attitude of many developers, councils and landowners and habitat loss is damaging our butterflies to such an extent it's of real concern. 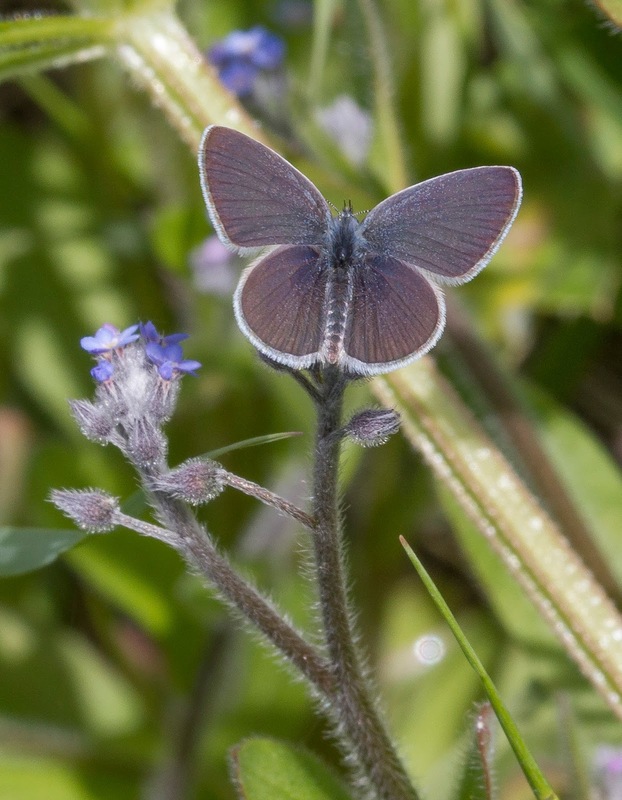 I've lost count of the many stories I've heard at butterfly sites from people all around the country of populations that have been lost due to sites being built on or destroyed. 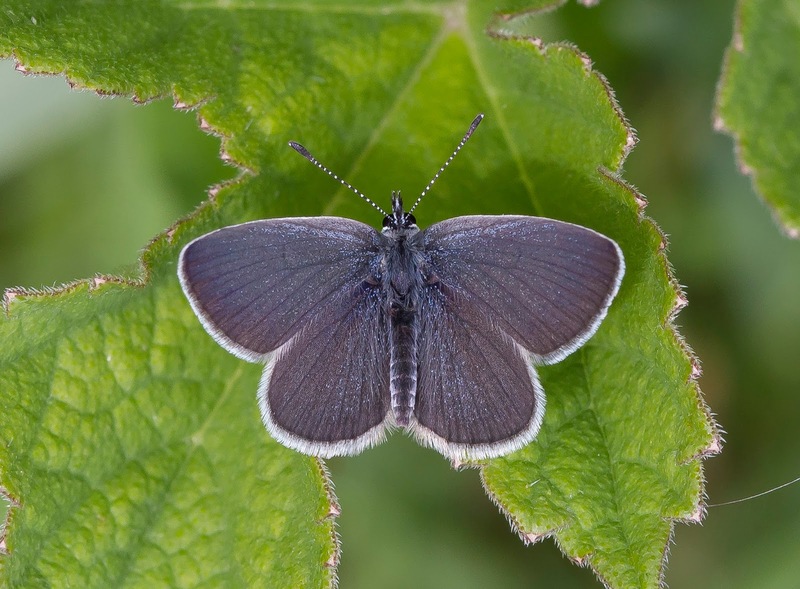 My local patch at Grange Park in Northampton is a superb site for Common Blue, Brown Argus, Small Heath and Marbled White etc but by the end of the year it us due to be flattened and become transformed into two large industrial units. It's heartbreaking it really is, but it's just one story amongst many and it's happening all around the country as the authorities turn their backs on nature in favour of investment. I'm certainly not opposed to development but until the planners and decision makers take proper account of the ecology of the sites to be developed (and I don't mean turning up in February, saying "there's nothing here" and walking away again) then there will be serious issues in the future. This is the first post from me after a long break from blogging. I don't tend to write about the stuff I do locally and my winter has been filled with BTO WeBS counts and Butterfly Conservation work parties etc. 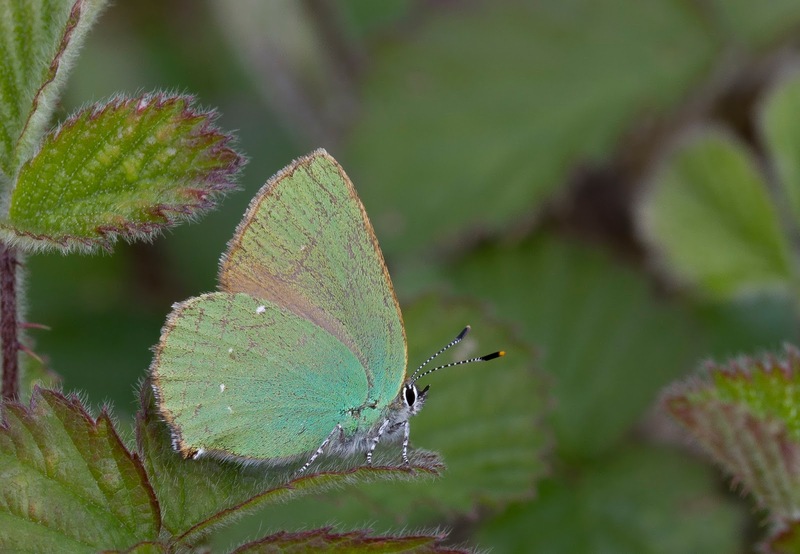 The issues outlined in the previous paragraph have led me to take more of an active role within Butterfly Conservation and I now find myself as the Membership Secretary of the local branch (Beds and Northants) and also run their Twitter account in an effort to spread awareness. It's not all doom and gloom though and over the last month or so I've been lucky enough to see some great butterflies which will be outlined below. A few people have inspired me to blog again and I've been asked why I've stopped a number of times (even by a nice couple from Lancashire last weekend! 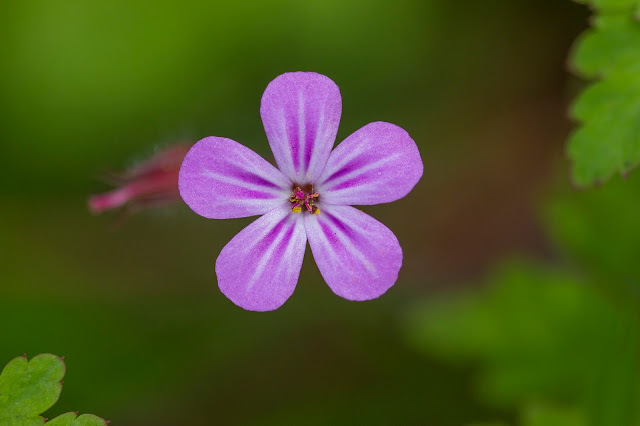 ), and reading other peoples great blogs have given me the push to write again including local photographer Doug McFarlane's blog here and Lucy Flower's Natural Interlude here both of which I can recommend a read of. 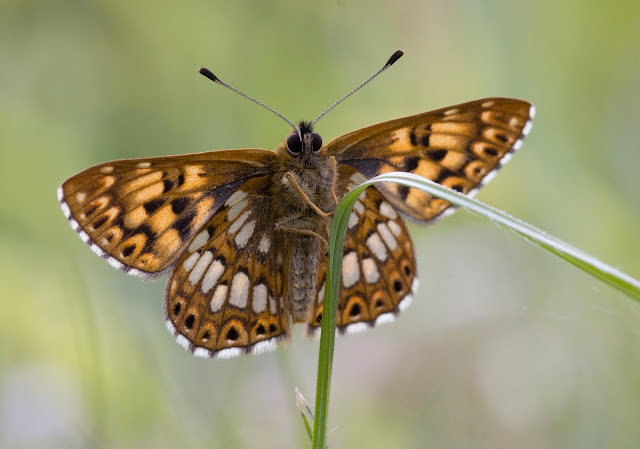 I'm very lucky to have some great the Duke of Burgundy sites not too far away down in the Chilterns and the first ones to be seen emerged up on Ivinghoe Beacon so on the 2nd of May me, Jon and Kirsty headed over to take a look. 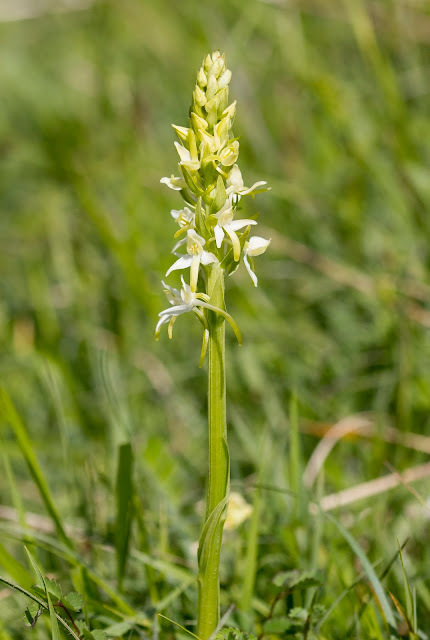 As it was so early for them it became quite clear that a lot of searching was going to be involved and while we were there we bumped into Lucy Flower and lead ranger at the Ashridge Estate Lawrence Trowbridge. 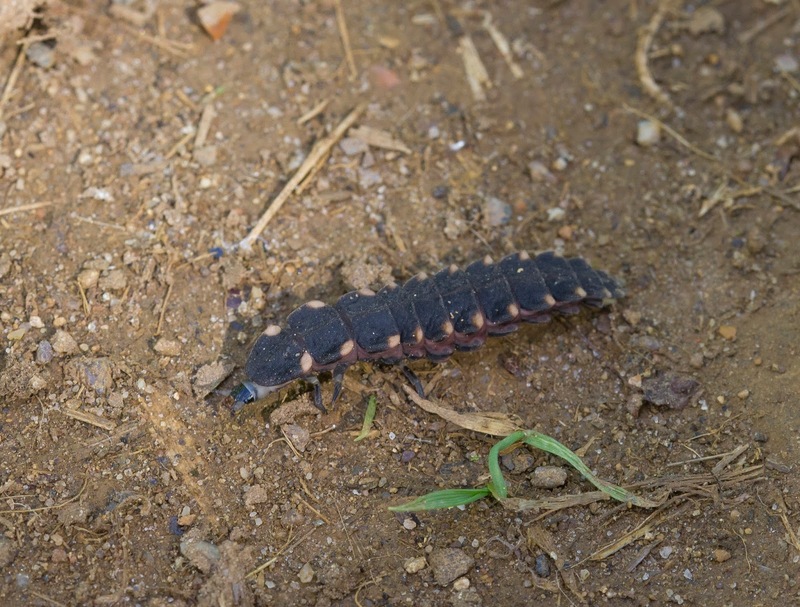 A short time later Lawrence found one in a secluded area near the road and luckily it hung around long enough for us to get some shots of it. 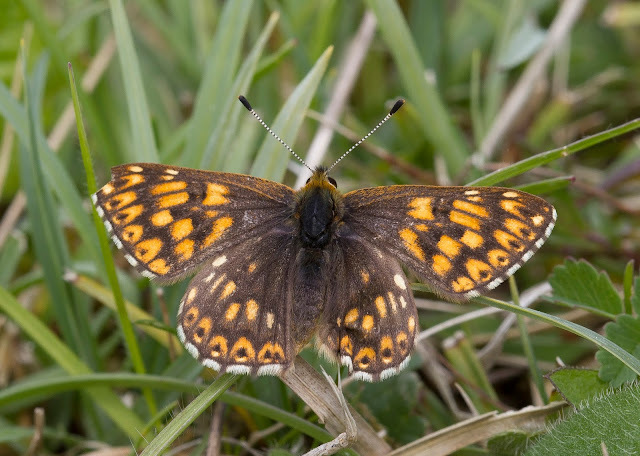 It's always a cause for celebration when you see these as you know when the Dukes are out the butterfly season is well underway! 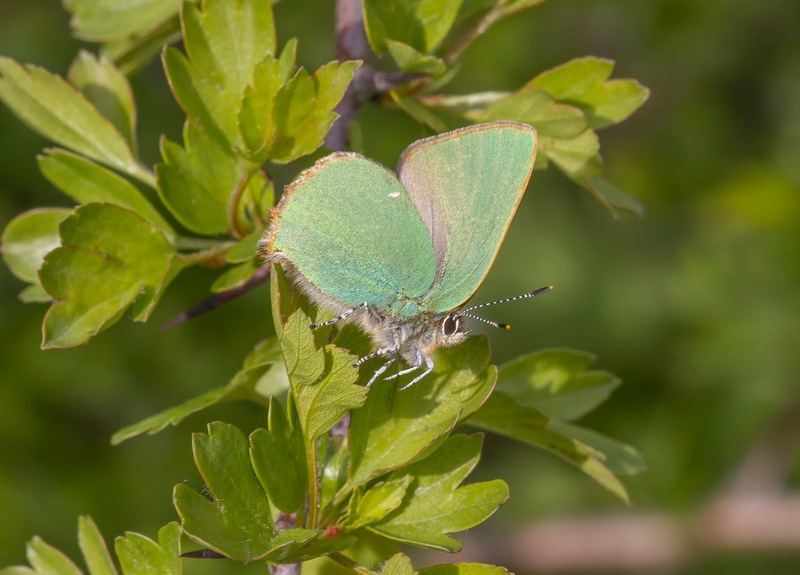 The bushes along the roadside were also full of Green Hairstreaks which provided an added distraction from the single Duke and a rather colourful Yellow-tailed Moth caterpillar posed for photos too! The following day I returned to Ivinghoe Beacon this time with John-Friendship Taylor and Simon Hales for hopefully more of the same but unfortunately the weather wasn't too good and despite a lot of searching we couldn't find a Duke. The other specialities of the area more than made up for it with more Green Hairstreaks and a stunning Holly Blue which I managed to get a photo of almost completely open winged! 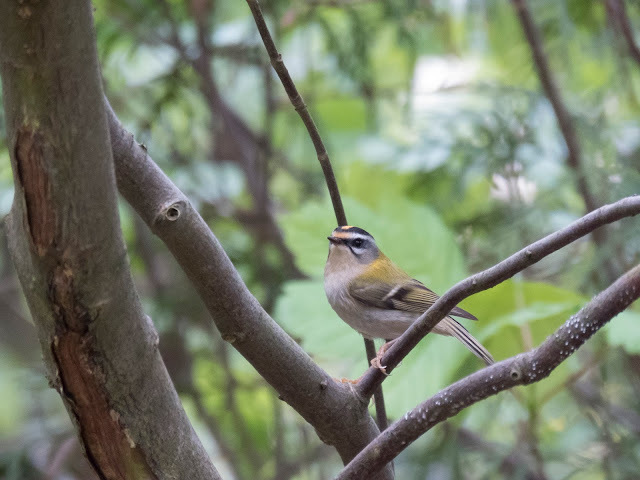 We also took the time to explore the nearby Wendover Woods as Simon had never seen a Firecrest before, we were very glad we did as we found the showiest Firecrest I've ever seen! 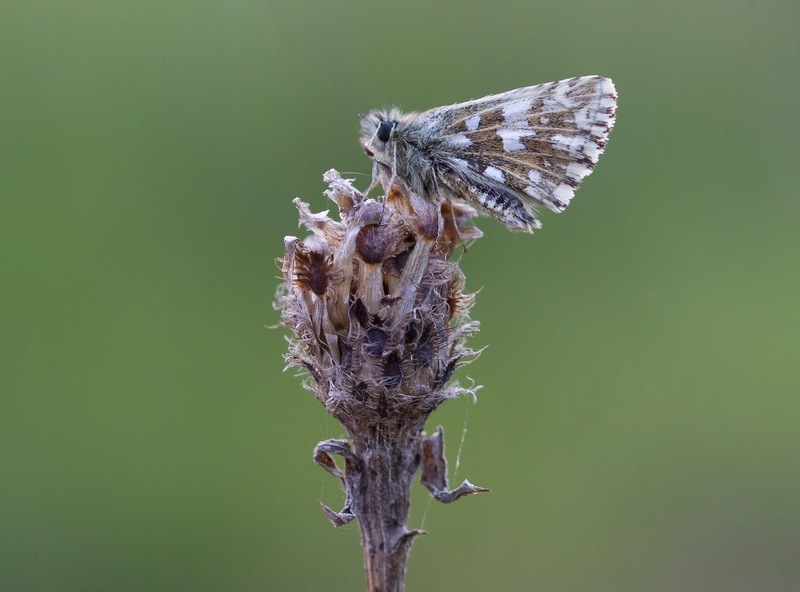 A couple of weeks later me and Simon Hales came back down to the Chilterns but this time headed to the Bedfordshire site of Totternhoe. It is such a superb area and there are things to see all over the place, in fact you could easily spend the whole day here. We headed straight towards the Duke of Burgundy area admiring a Corn Bunting singing it's head off along the way and it wasn't long before we were in the hollow at the east end and surrounded by Dukes. They are such charismatic little butterflies and a real joy to photograph as they perch up keeping an eye out for any other butterflies that stray into it's patch. After filling our boots with the Dukes we then wandered off to explore the area with a particular Orchid in mind that I'd never seen before. We had been given directions and even armed with these they were quite difficult to locate but after a bit of searching found the stunning Man Orchids. 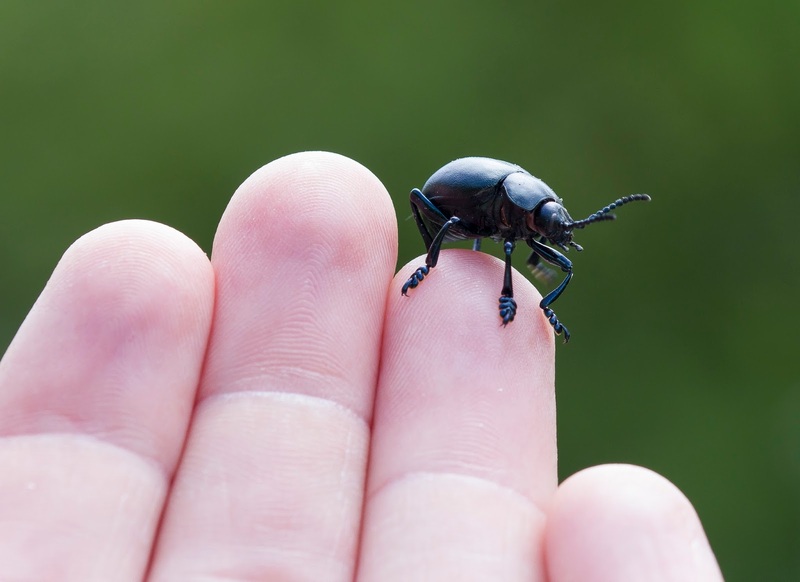 We also found a rather friendly Bloody-nosed Beetle along the track too. 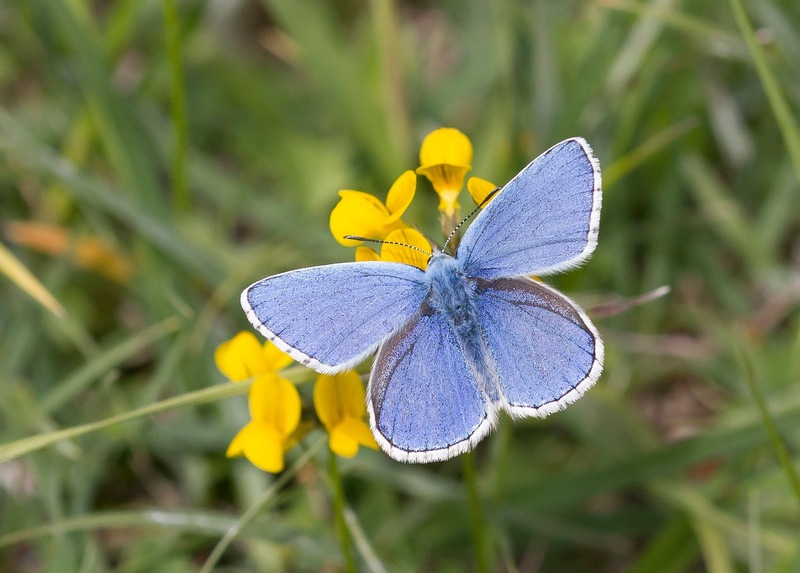 When we arrived back near the car park we checked the area that's famous for it's Small Blues and met Jon and Kirsty who had also arrived on site. 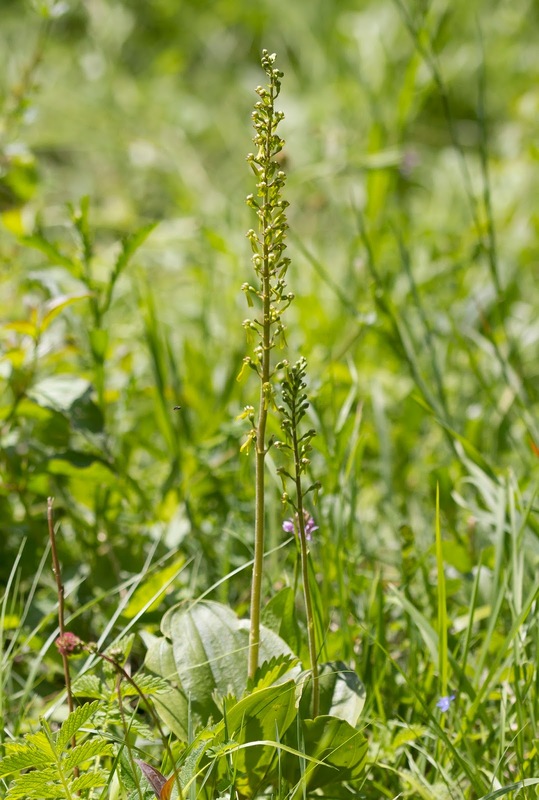 I had found one earlier but the day's strong sushine must have triggered an emergence as upon return several could be seen in the tall grass along the fence line. We then decided to leave the site and head back up into Northants. 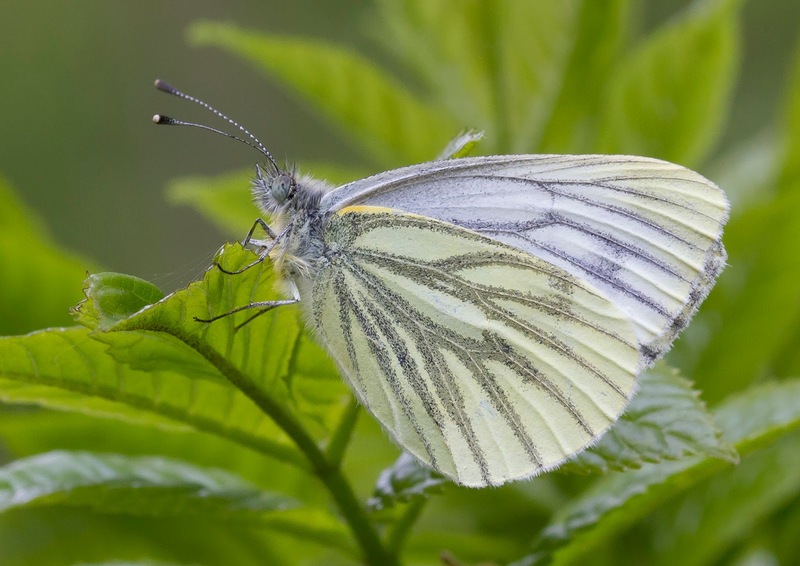 Simon had never seen a Wood White butterfly before and as were seemed to be on a roll be decided to ignore the thick dark cloud that had now rolled in and try and find one in Salcey Forest. 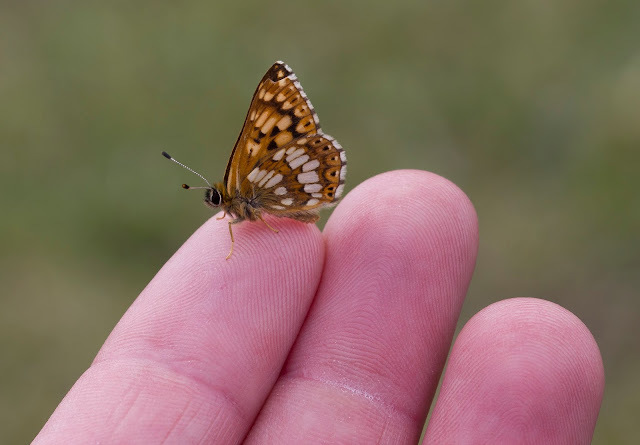 Amazingly as we walked along the path from the Horse Box car park and into the wood we picked one up resting on a plant. A great end to a great day! 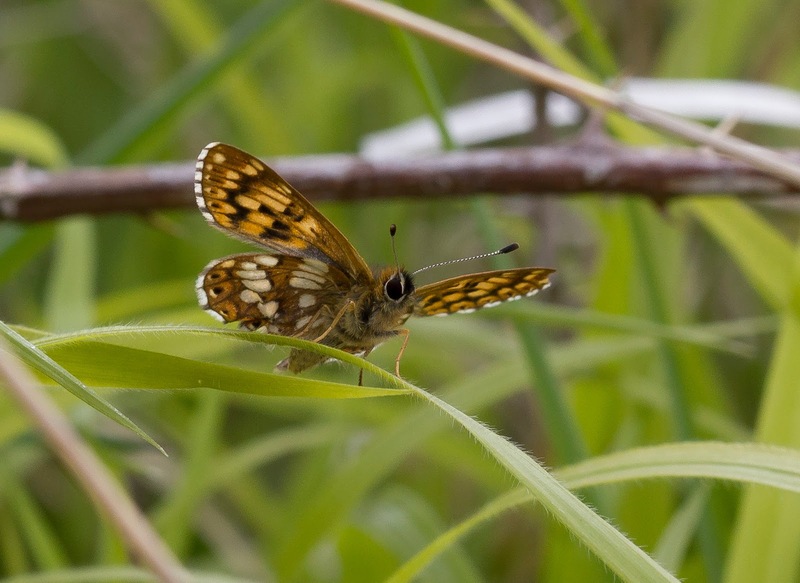 On the 5th of May we had a local branch Butterfly Conservation event to see roosting Skippers at Twywell Hills and Dales. The weather once again tried it's best to make things as hard as possible with a high wind relentlessly tearing across the site. I always find it amazing how wind direction always has that habit of being in exactly the wrong direction and this evening it was perfectly aligned right down the middle of the main ride! 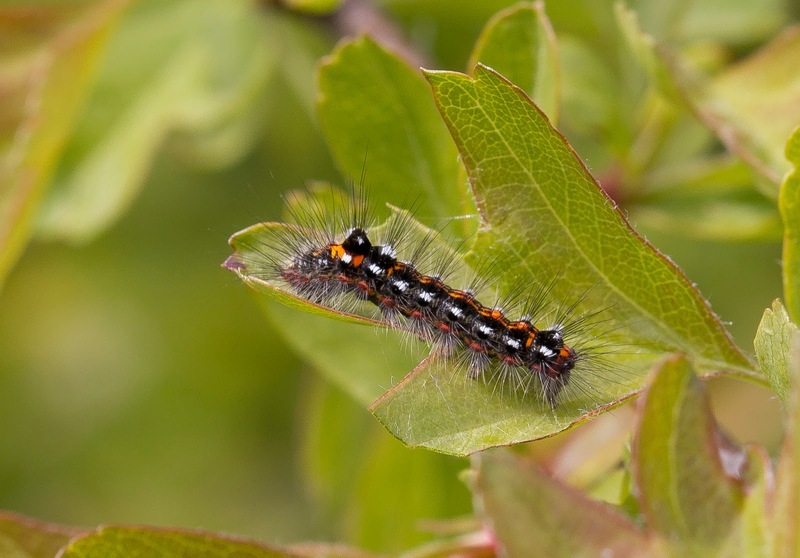 Despite this though we decided to make the best of a bad job and with us all separating we soon found quite a few. 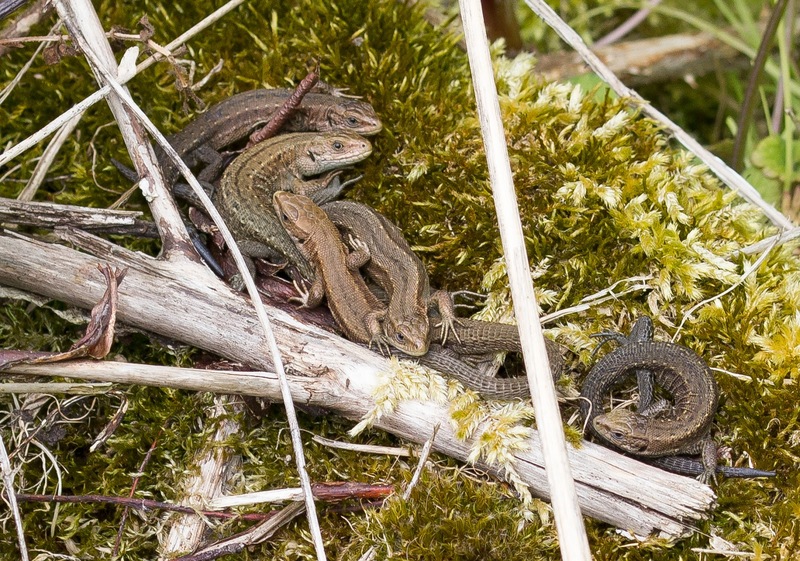 It's amazing how they can cling on in a wind we were finding it quite difficult to even walk in. A little bit of teamwork helped to get the pics too as the picture taken by Doug Goddard below shows, with me laying on the floor trying to get the pic while Andy Wyldes holds the butterfly steady in the gale! 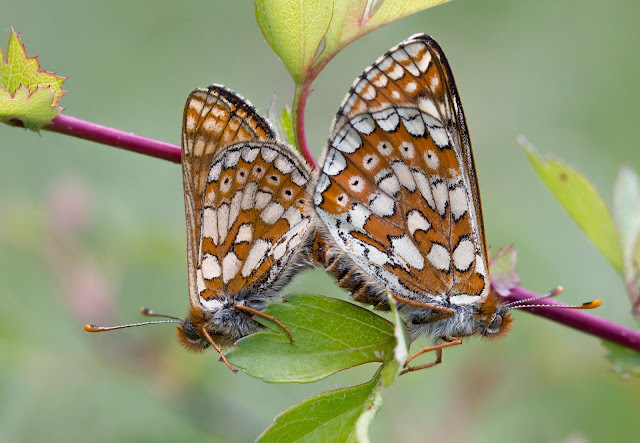 It's really interesting to take the time and see these specialist butterflies roosting like this and if you have them at a site nearby I can recommend visiting in the evening to see it for yourself. 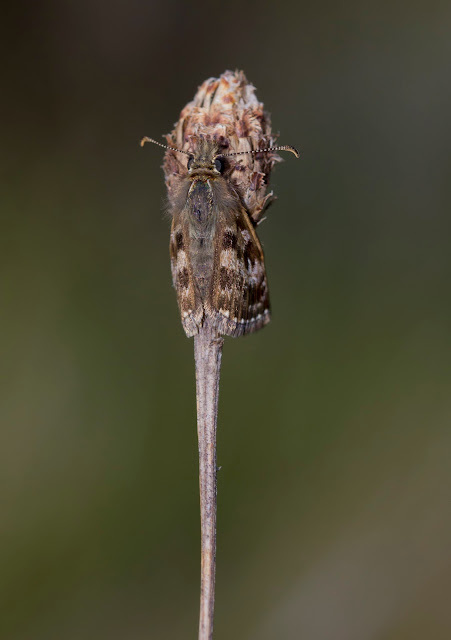 It's amazing how well camouflaged the Dingy Skippers are when hugging their chosen perch for the evening. Even the Grizzled Skippers which roost much more prominently take a bit of finding as they're so small. 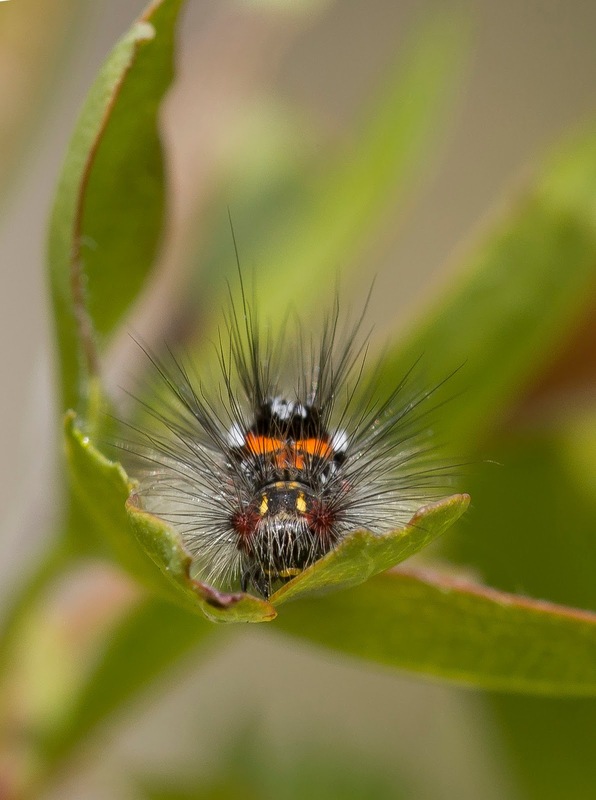 Of course where you have a reliable place for wildlife to visit you will also find the predators that like to prey on them. 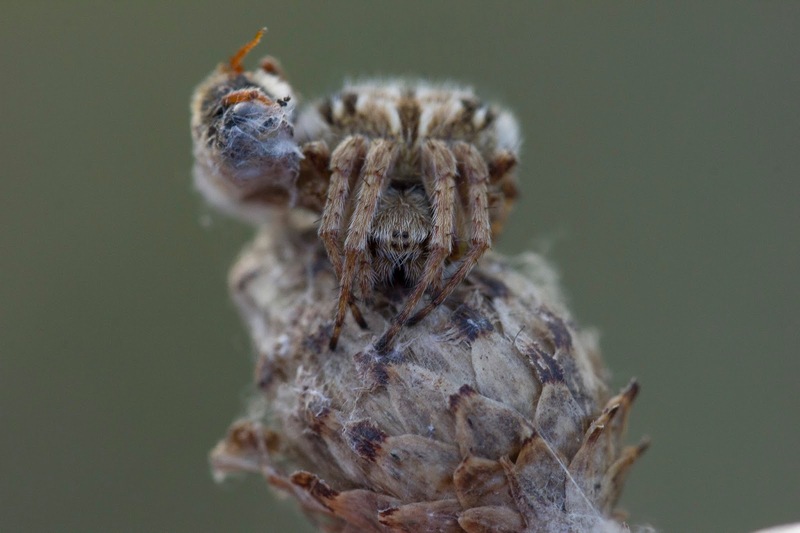 In the Skippers case it's this little killer, the Gorse Orb Weaver, sitting next to it's kill from earlier in the day. It's always a real pleasure to go out chasing butterflies with Doug and Andy and with their extensive experience you can learn so much! Due to my local site now being set aside for development this year I've moved my local patching to Salcey Forest and an incredible site it is too. The area is absolutely huge and there is always something to see. It's almost impossible to do the entire site in one day as it's so vast but I am enjoying exploring all the rides and tracks and it has been coming up with some great surprises. 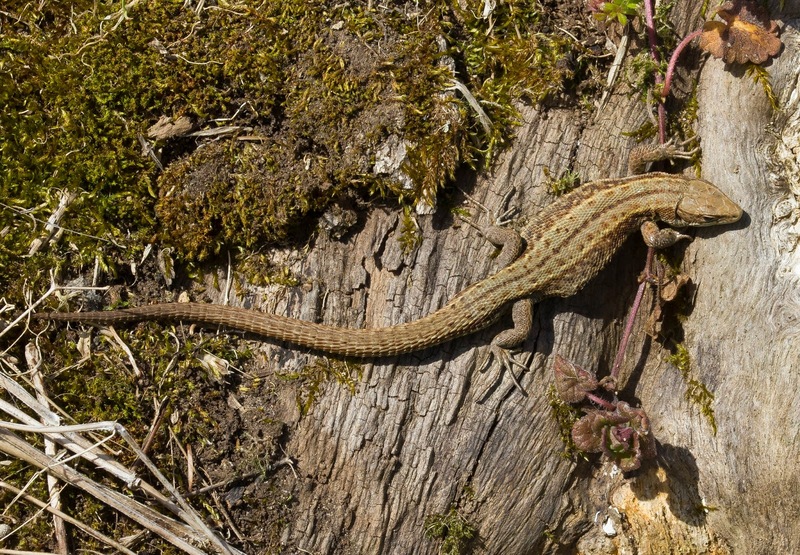 The first part of spring saw the emergence of our Common Lizards and they really like some of the large Oaks in the forest to bask in the sun. 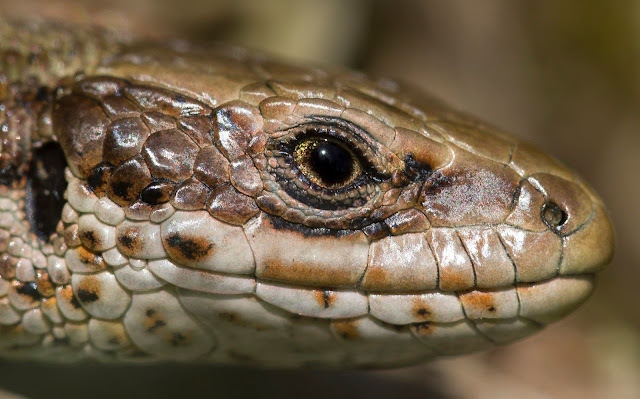 I've been all over the country to look for wildlife but I've not had better views of Common Lizards anywhere else and it's amazing to be able to get so close. 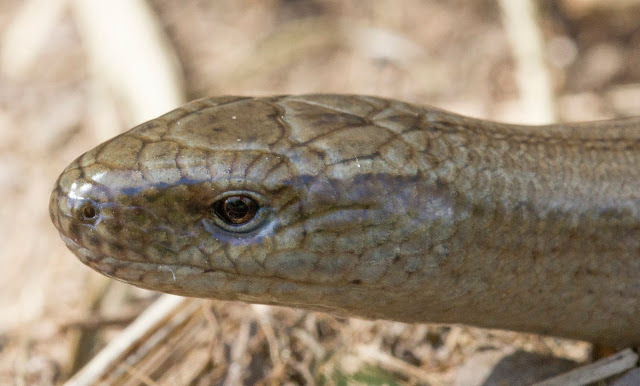 Arriving early means you can see them before they've warmed up and they're still a bit sluggish and you can get a lot closer than you can at midday when they're off at the first sign of anything approaching. 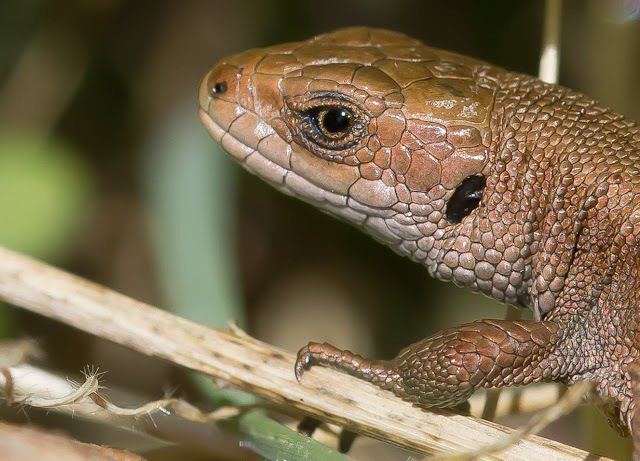 A great deal of patience also helps as gradually they get used to you and you can snap away, it's not everyday you get to take macro shots of such a fast reptile! 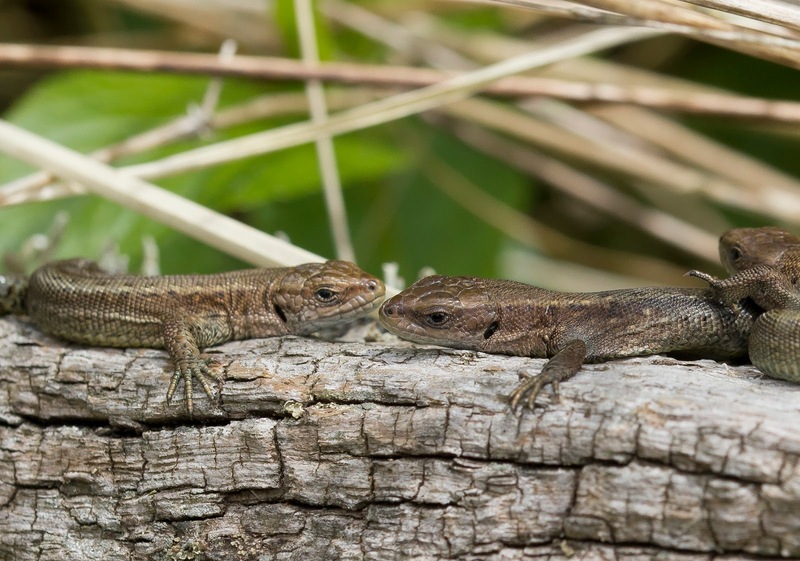 I didn't use a flash with these as that would disturb them too much so believe it or not that round light in the Lizards eyes is actually the sun. It's really nice to see them in such good numbers too. My highest count was 16 on one tree and sometimes you could come across some quite sizeable groups all huddled together. How many can you see in this photo? 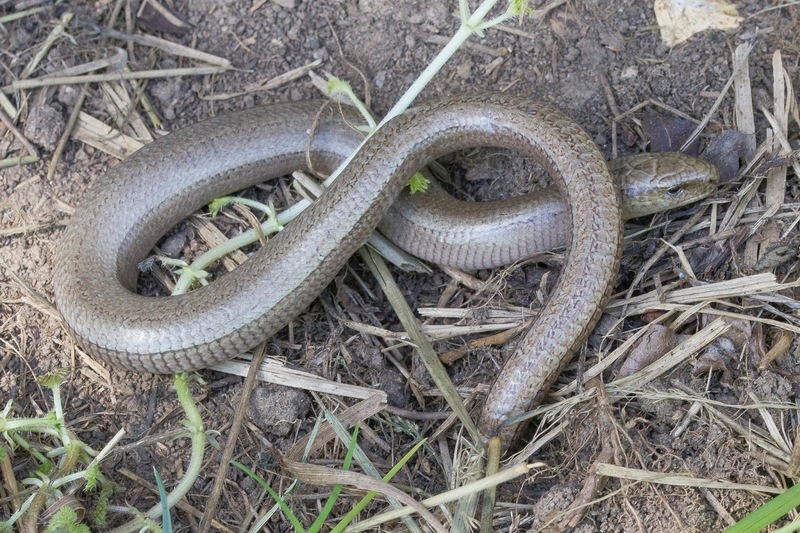 Other local reptiles are the Slow Worms and quite a few individuals have been seen in the forest. Some of the local bugs have been great to find too and it's the beauty of macro photography that everything comes alive when seen close up. There is so much to see down there in the undergrowth but the majority of people simply walk passed it all without noticing what's beneath them. 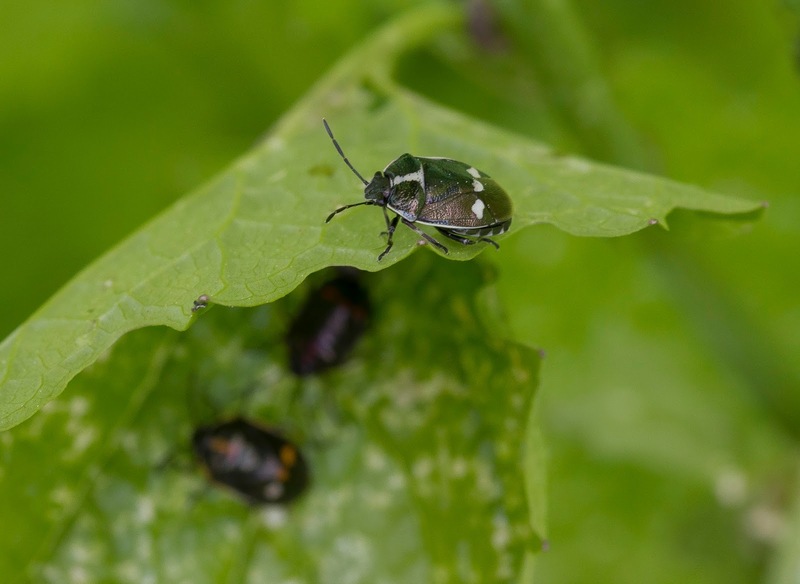 The Brassica Shieldbugs were new to me this year and I've been seeing quite a few dotted around on the Garlic Mustard. 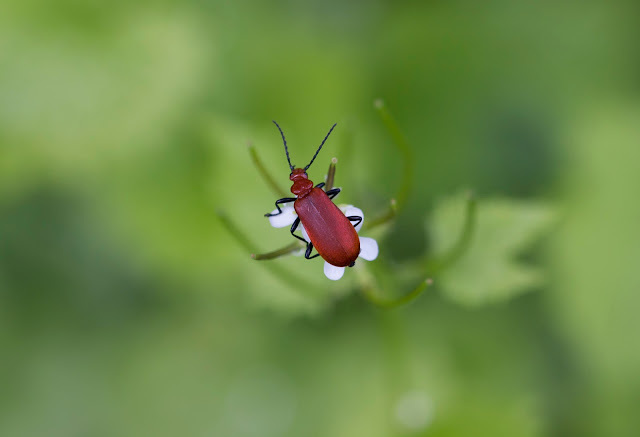 The Cinnamon Bugs and Cardinal Beetles also add a dash of colour to the green undergrowth too. 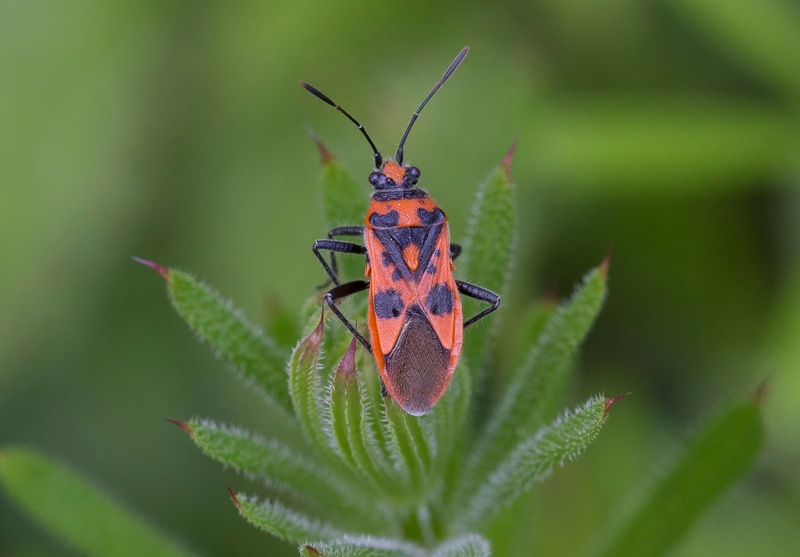 During my photography session with the Cinnamon Bug a family came passed who were giving me some right funny looks as I snapped away! Also spreading a little colour amongst the hedgerows were the new flowers coming up. Forget-me-not and Herb Robert being particularly easy to find. On one of my visits is was nice to see a large Glow Worm larva making it's across the path. 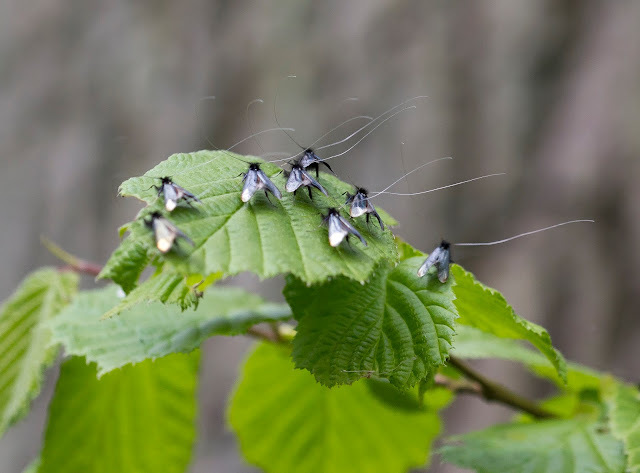 I've only ever seen Glow Worms actually glowing on one occasion and seeing this has given me the urge to get out here one night and try and do a survey. 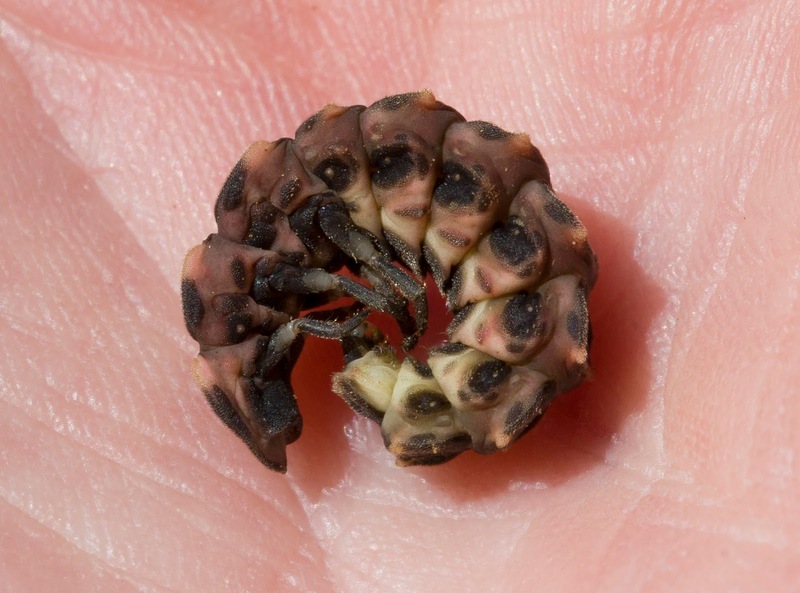 It is of course actually a beetle rather than a worm and it's a ferocious predator of snails. 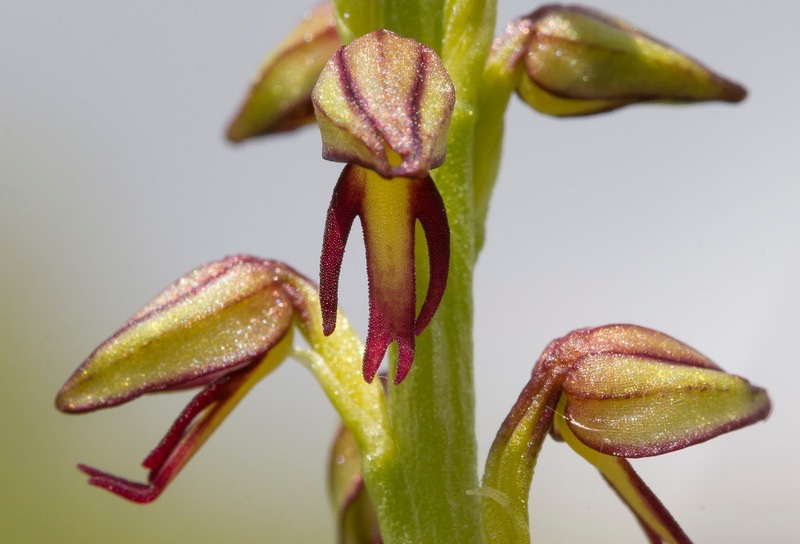 It does look pretty alien when seen close up. 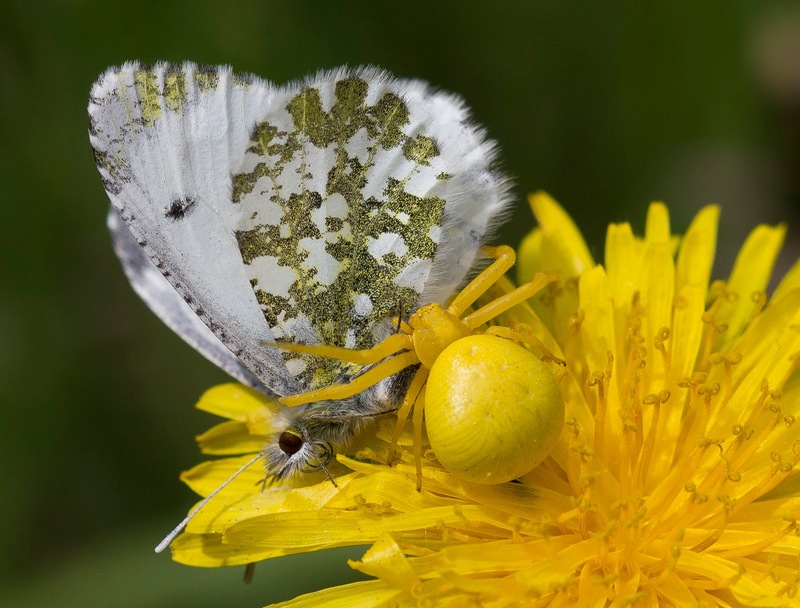 I know from past experience that Salcey Forest is also a great place to see one of my favourite arachnids, the Crab Spiders. 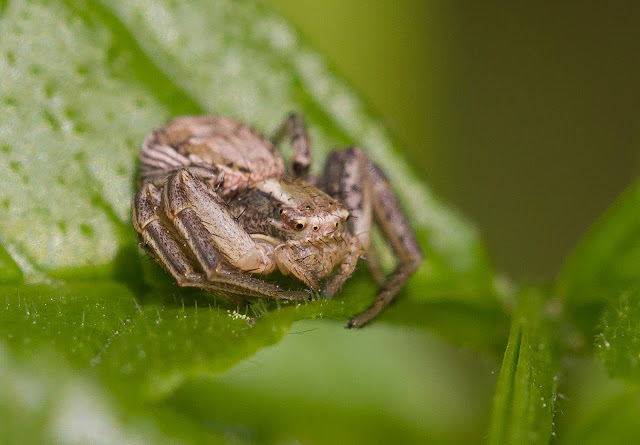 There are a few different species of Crab Spider here and some can be seen on the leaves like the ones below. 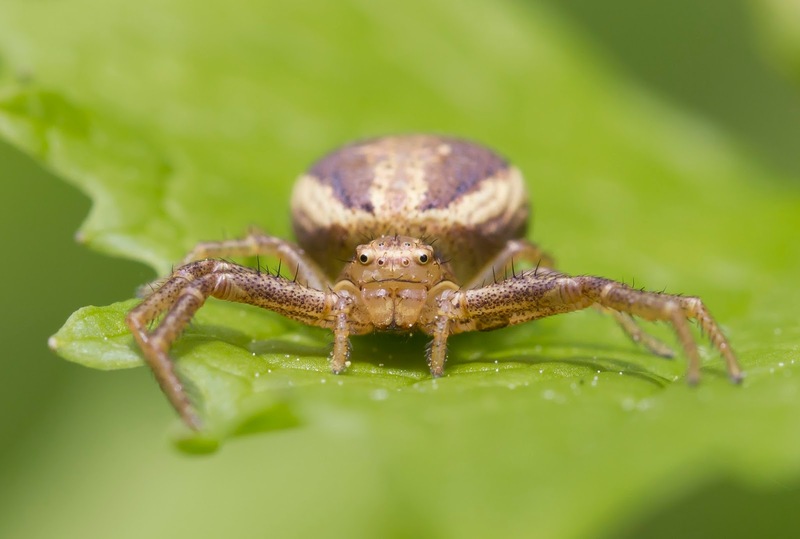 If you're scared of spiders it's probably best to skip this next bit! 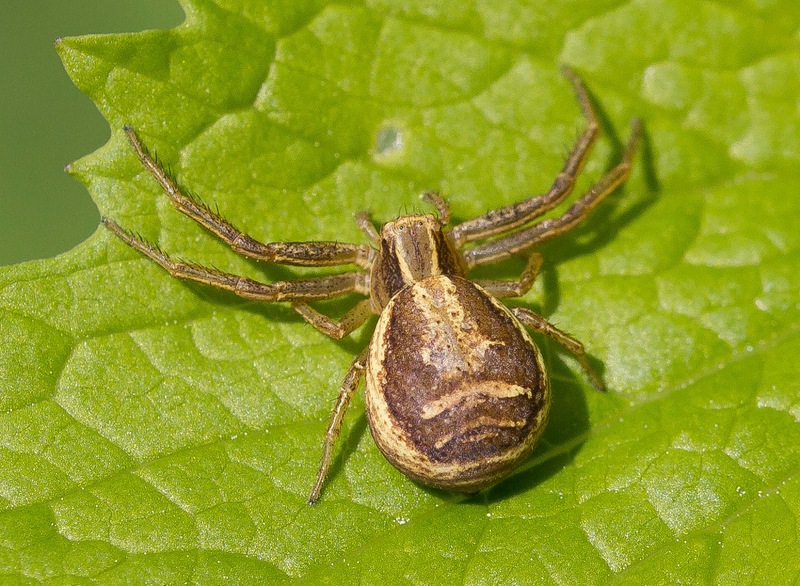 We also get good numbers of a very special Crab Spider called Misumena vatia. 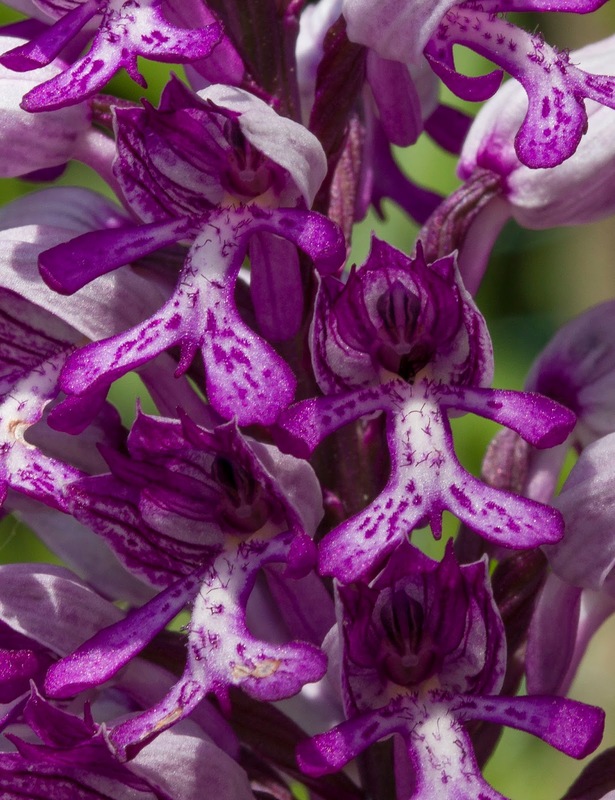 This is special due to it's incredible camouflage as it can change it's colour to match the flower it's on. 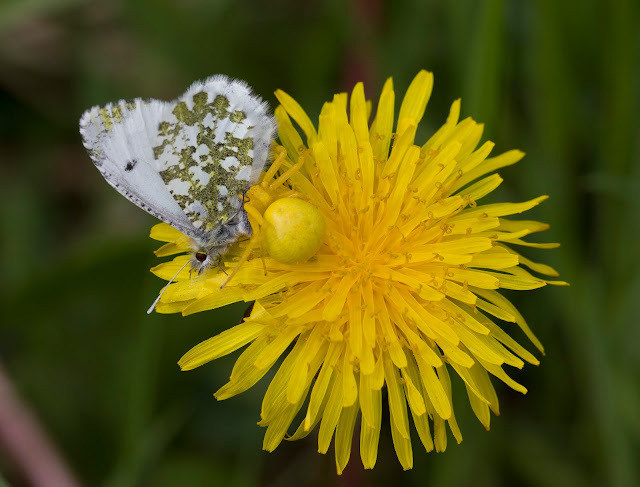 One afternoon while on a stroll through the wood I noticed a female Orange Tip butterfly sitting patiently on the top of a Dandelion and as I got closer I realised why. I certainly hadn't seen the Crab Spider and neither did the butterfly leading to an unfortunate end. This was the first time I'd seen a yellow one! I returned to this location the week after I took the above pics and I managed to locate the same Dandelion to find it had turned into a seed head. 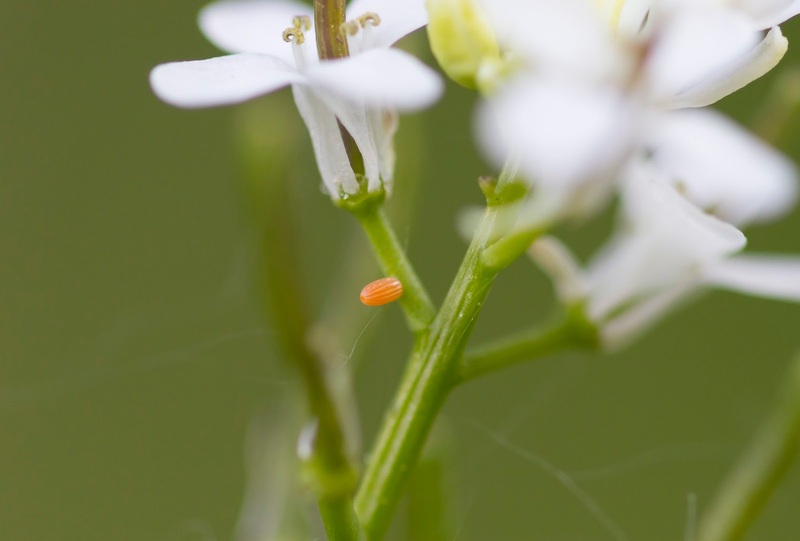 I was amazed therefore when I got closer and found not only was the Crab Spider still on it, now nestled in amongst the seeds, but it was still catching prey! 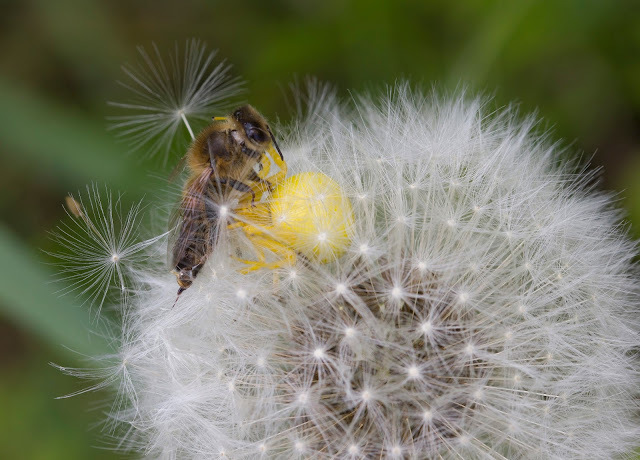 This time it had caught a Bee sp. Crab Spider and Bee sp. 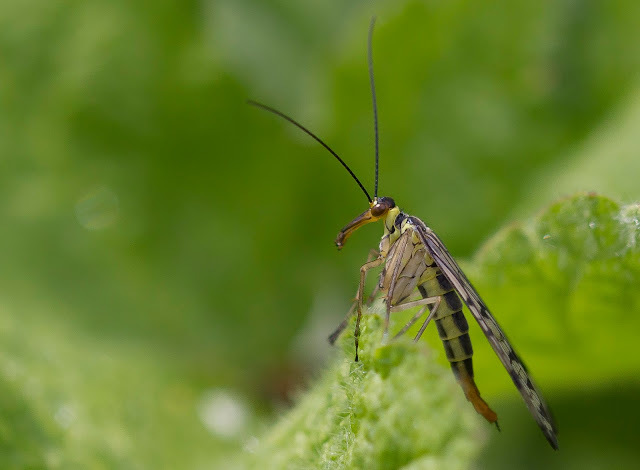 While admiring the many Crab Spiders other insects were gradually starting to emerge in the forest including my first Longhorn Moths and Green-veined Whites of they Year and the strange looking Scorpion Flies. 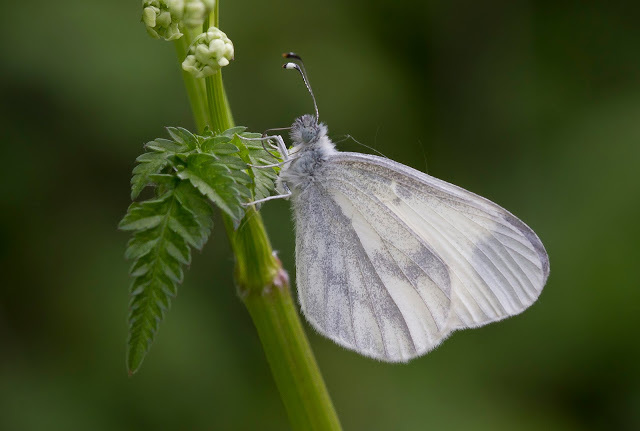 My first Wood Whites of the year came on the 16th of May with several on the north side and a couple on the south. 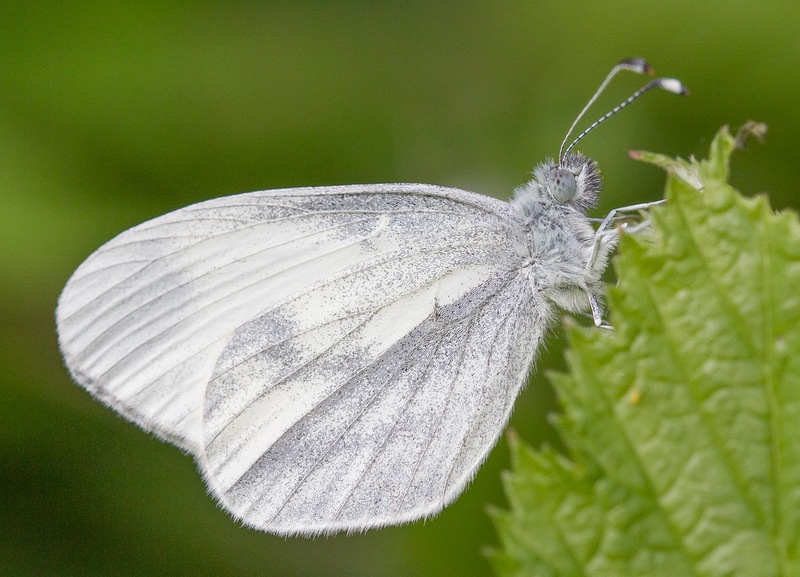 As I write this the Met Office is predicting some good weather for a change at the weekend so I'm looking forward to getting out there and doing a proper Wood White survey. 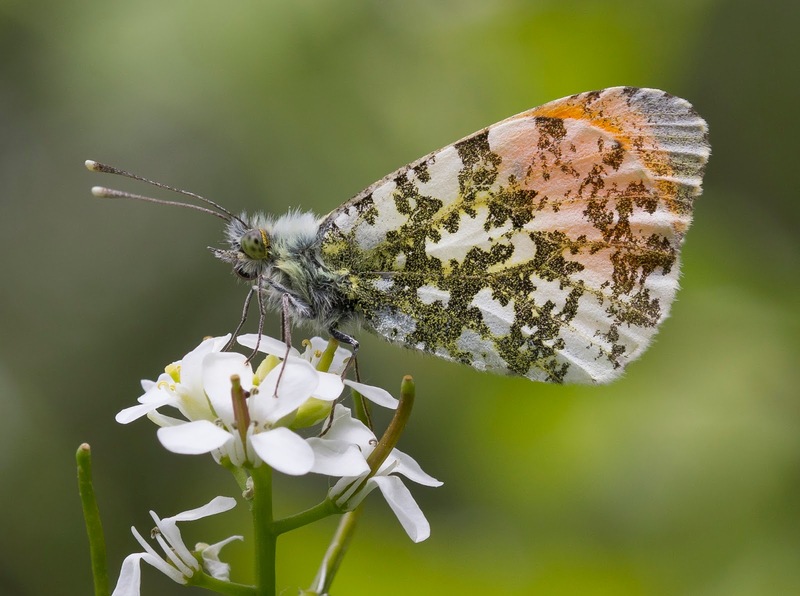 Other spring butterflies, as already mentioned, were the Orange Tips and as always getting photographs was a challenge to say the least! 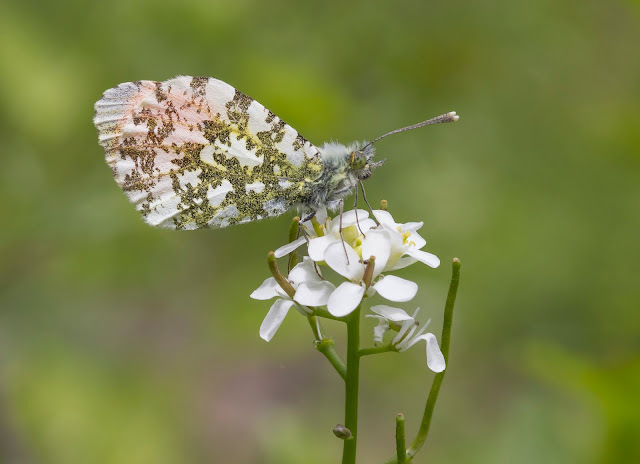 A bit of perseverance paid off though as eventually I had a couple settle and one evening I also visited in order to look for Orange Tip eggs finding quite a few along one of the better rides for them. 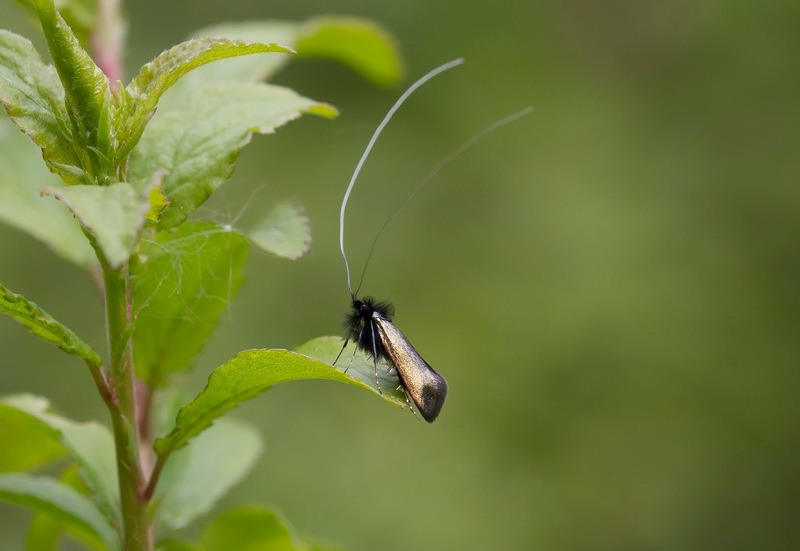 On the 23rd of May me, Jon and Kirsty headed to a very special place indeed to see some very special butterflies. 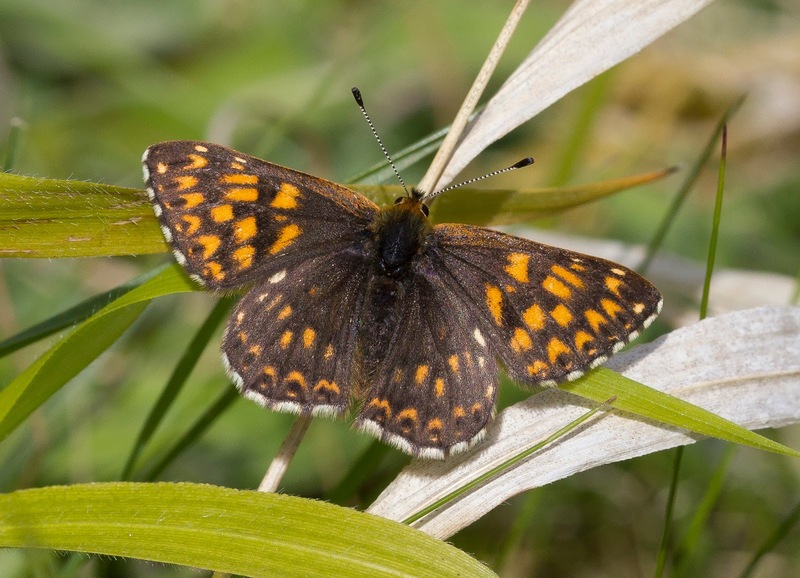 The main target of the day were the Marsh Fritillaries at Strawberry Banks but we also couldn't resist a visit to Hailey Wood to try and see some Pearl Bordered Fritillaries first. 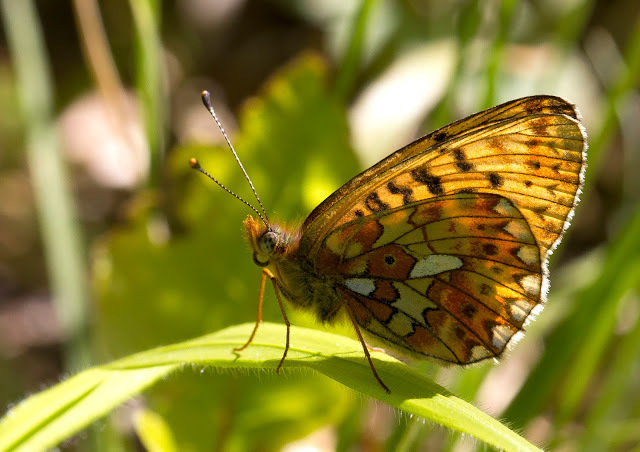 We wandered down the path passed the Saw Mill and into the clearing and almost straight away a Pearl Bordered Fritillary whirled across the path in front of us. Bitter experience from last year taught us to get here fairly early as once the Pearls have warmed up they're almost impossible to photograph. The morning was perfect though with enough sun to keep them active but enough cloud to keep them still for longer than a couple of seconds! 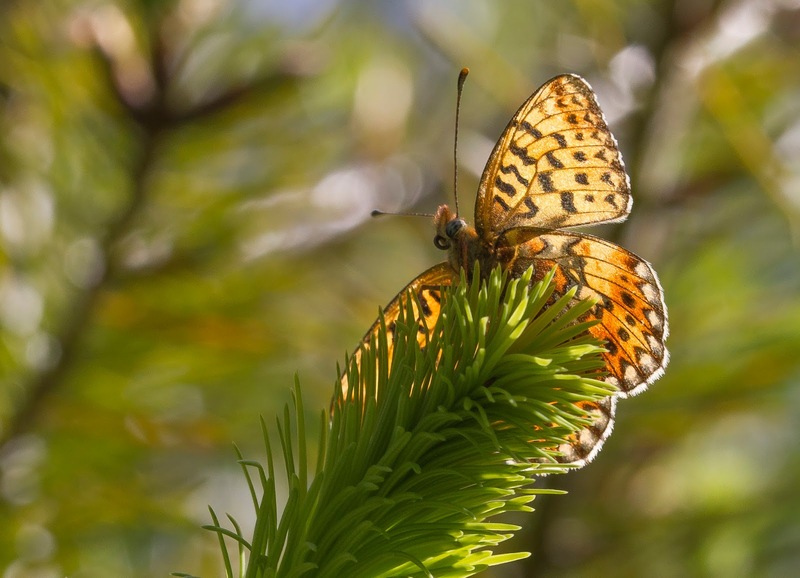 It's also easy to forget when looking for butterflies that it's always a good idea to look up as these Pearls really like to perch on the tops of the trees! After we'd taken lots of photos we then moved onto Strawberry Banks. Lots of reports had come through during the previous week of what a spectacle it was and they certainly weren't wrong. We parked up at the bottom of the wood and walked up the steep footpath (almost being blown away by the strong smell of Wild Garlic) and entered the site to be confronted with quite a sight! 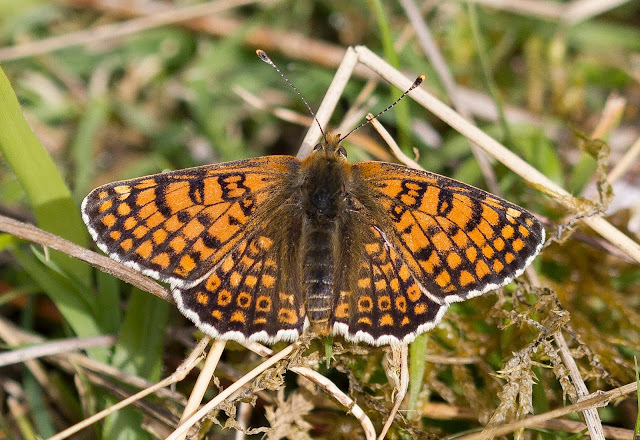 Lots and lots of Marsh Fritillaries! 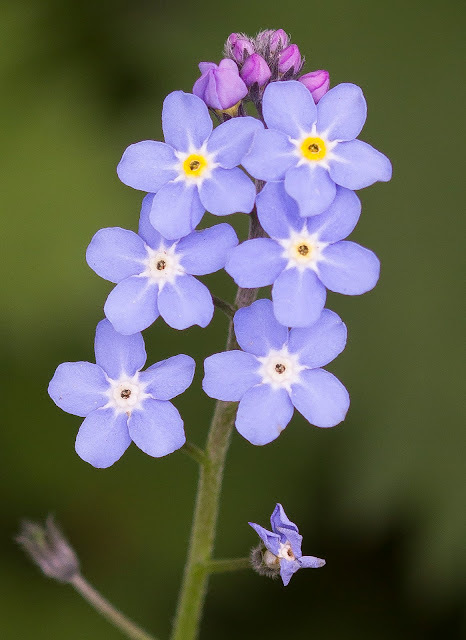 They were everywhere and as you walked carefully through the grass they flew up in front of your feet only to settle back down on the next set of flowers. Last year there were a lot too but this year was something else. We certainly didn't waste anytime and got straight to work taking photos. It was such a pleasure to spend the next few hours in such an incredible place! A few very nice looking Common Blues were also on site and proved rather more difficult to photograph than the Marsh Fritillaries. It was also great to see many other people who had made the trip to witness this spectacle and a great deal of time was spent chatting to others from around the country. 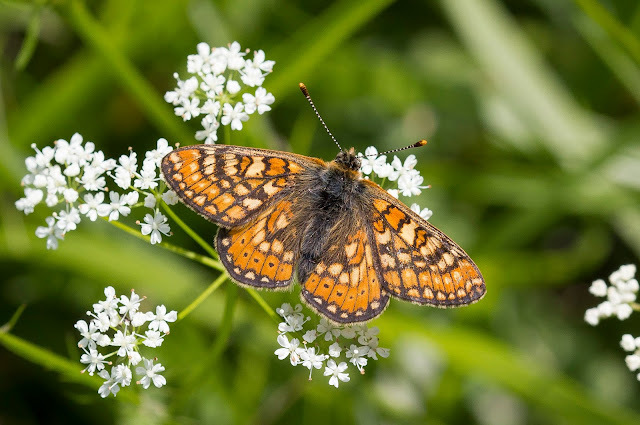 It's great to listen to the stories and tales from other peoples sites and it's interesting to hear how other Butterfly Conservation branches work and meet their volunteers. 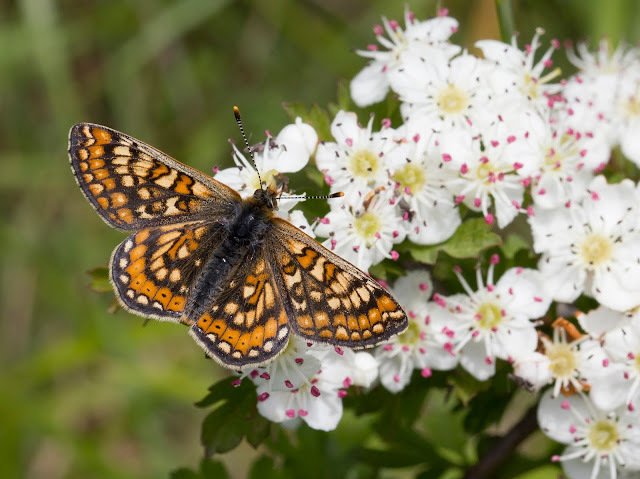 It should also be mentioned that it's not just the Marsh Fritillaries at Strawberry Banks that makes the place so special. 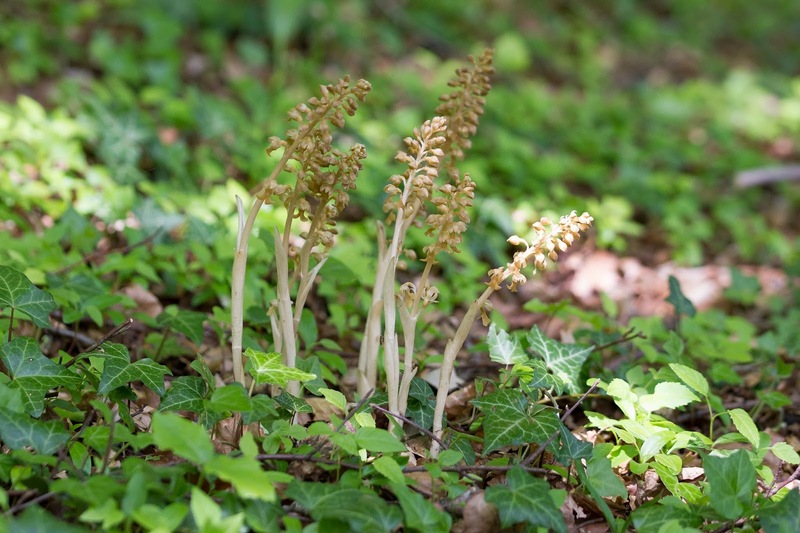 It's also a superb place for Orchids and right from getting out of the car by the road you can see spikes of Birds Nest Orchids reaching up through the leaf litter. When up on the reserve there were lots of Early Purple Orchids and some very nice looking Lesser Butterfly Orchids too. 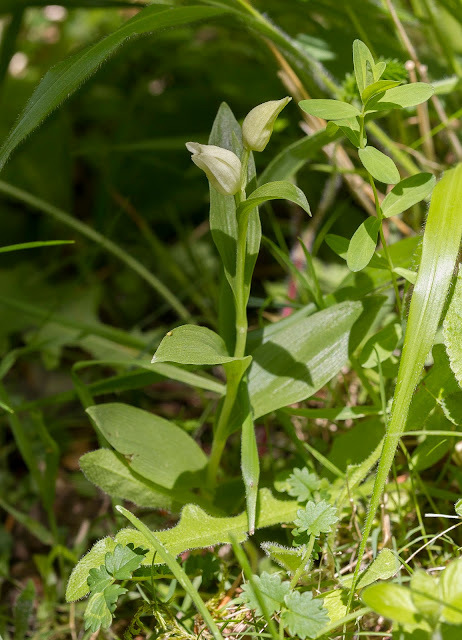 I was very excited to see the Lesser Butterfly Orchid and such were the numbers of Marsh Fritillaries I decided to see if I could get a photo of the two together. 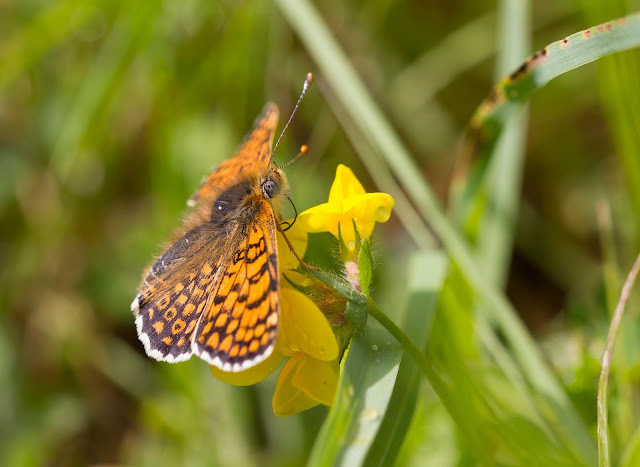 I waited patiently by a flower and it didn't take long before a Marsh Fritillary landed on it. You don't very often get two target species in the one shot! 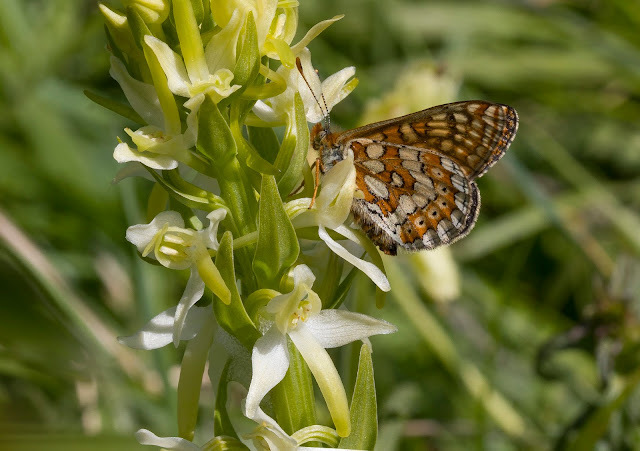 Marsh Fritillary on Lesser Butterfly Orchid. 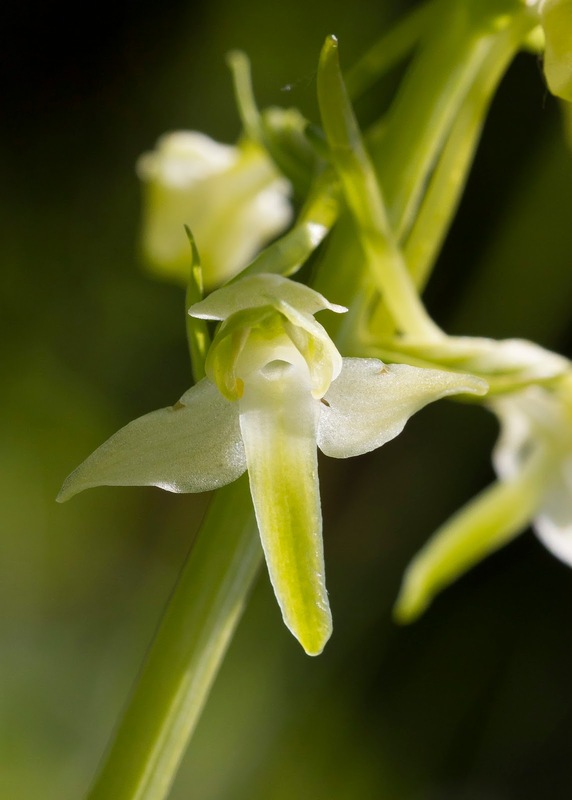 It had been an incredible visit to the site and all the butterflies and Orchids really made it a superb day. 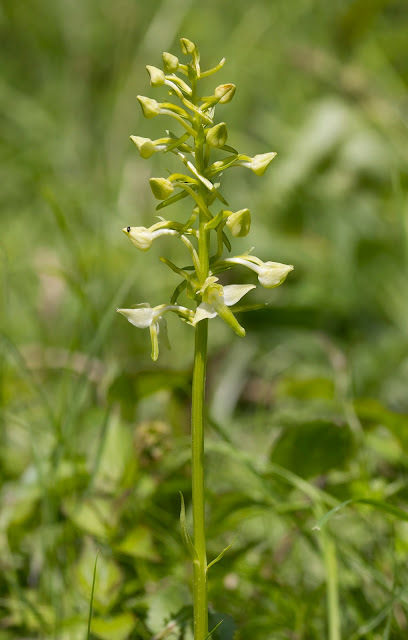 I finished it off by wandering up to the top of the bank and sat next to a small cluster of Lesser Butterfly Orchids, I put the camera down and and admired the Marsh Fritillaries flying around me while occasionally looking down into the valley to watch the many photographers running around getting their pics underneath. For a moment I think I even had a little snooze, today this place was paradise! 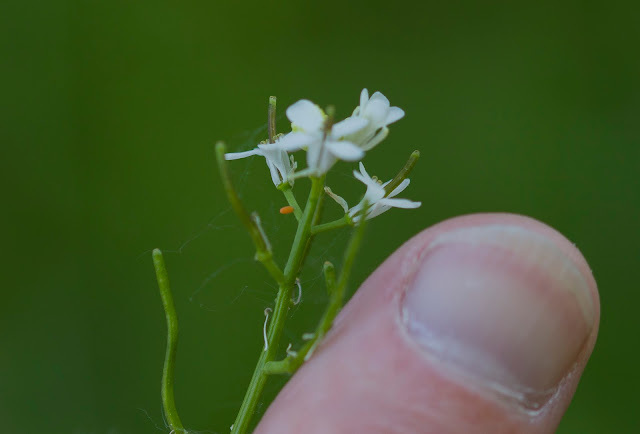 You may be forgiven for wondering why this blog post started with a history lesson but if you have made it this far reading this rather long post all will now become clear. 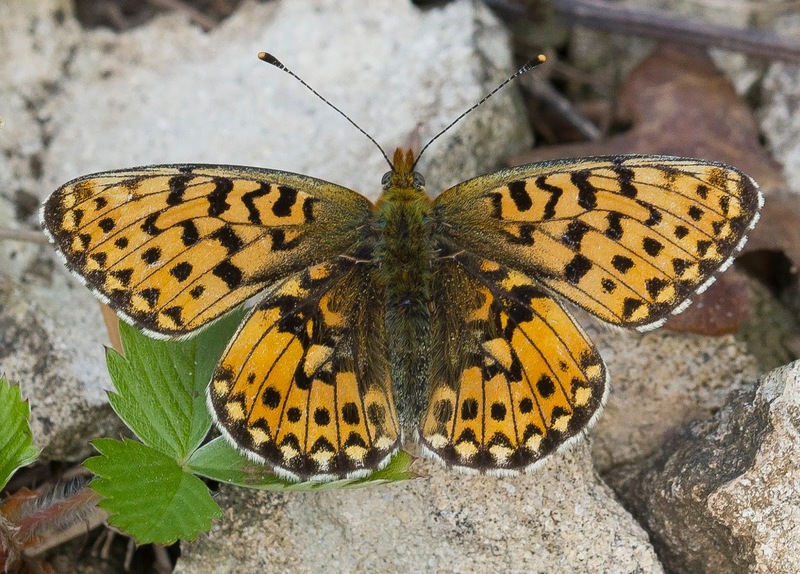 The lady who was the focus of the quote, Eleanor Glanville, had a butterfly named after her - the Glanville Fritillary. The only place to see the last of the truly wild ones is the south coast of the Isle of Wight and I can't justify travelling so far this year but luckily I was sent the directions to a site where they have been reintroduced in 2011. So on the 30th of May me, Jon and Kirsty found ourselves heading down to Surrey and to a nice little reserve called Hutchinson's Bank. The Glanville Fritillary is very much a sun loving species and today was meant to be pretty good first thing but unfortunately the long periods of predicted sunshine never materialised as ever thicker clouds rolled in. 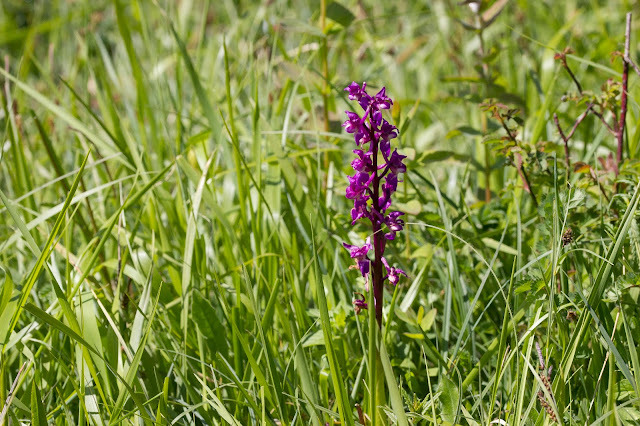 Only a Small Heath could be seen up in the cutting so I decided to try my luck along the footpath parallel to the road. 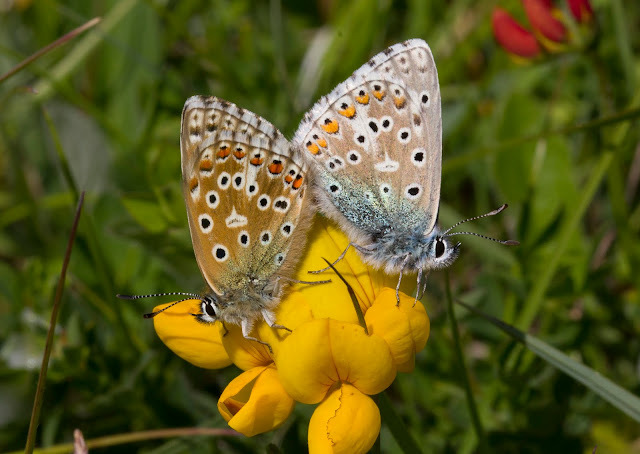 As I walked down the path I could see small clumps of Trefoil which was encouraging and despite the cloud and still saturated grass from the previous days heavy rain a Common Blue could be seen whirling about. My hopes were fading fast when all of a sudden a small brown butterfly came past me like lightning. I tried to chase it but it was going incredibly fast and I could hardly keep up with it. Then by an amazing piece of luck it changed direction and came straight back towards me and flew back over my head and landed in the vegetation in the hedgerow. I slowly walked towards it and as I got closer I got my first glimpse of that most exquisite underwing that belongs to the Glanville Fritillary. I rang the others to tell them I'd found one and started to take some pics while they came over. 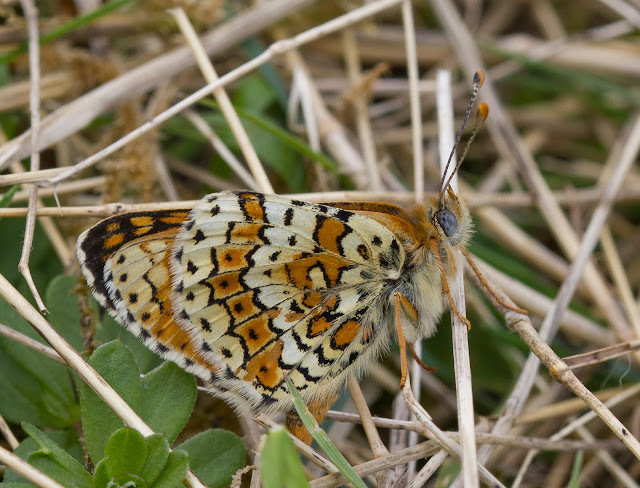 We did manage to find another Glanville Fritillary which posed nicely on some bare ground before relocating to a small bunch of Trefoil and evidently we were very lucky to have the views we did. A local guy also came down to join us and said he couldn't believe we'd seen one at all considering the conditions! 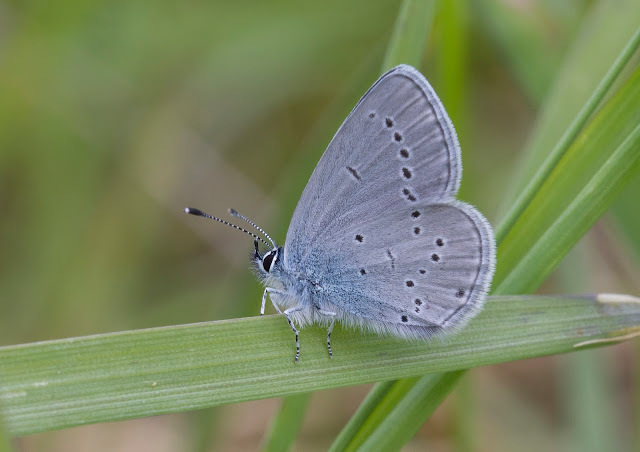 We also had a dapper Small Blue up in the cutting area which due to the weak sun sat patiently on a leaf trying to bask allowing everyone there to get a photo but unfortunately there wasn't much else to be seen on an overcast day like today. At least we'd seen what we were after! Luckily we also had another plan today once we'd seen the Glanvilles and one which wasn't quite so weather dependant. 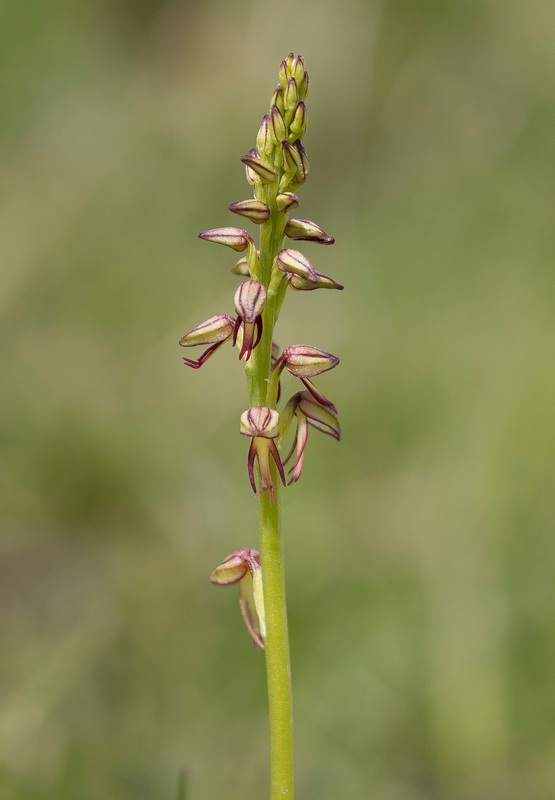 After seeing so many great Orchids this year I'd really got the bug and we decided to head to a fantastic Orchid Wood near Marlow on the way home after a tip off from John-Friendship Taylow who had been there week before. After some complicated navigation around the rural roads we found ourselves at the entrance to Homefield Wood and wandered in towards the first glade. 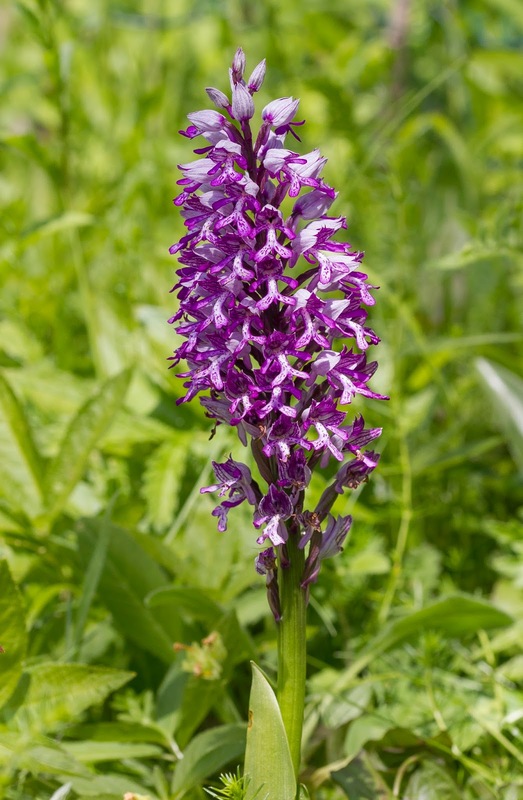 It is such a good place for wild flowers and the main reason for the site being famous is the rare Military Orchid of which there were quite a few. 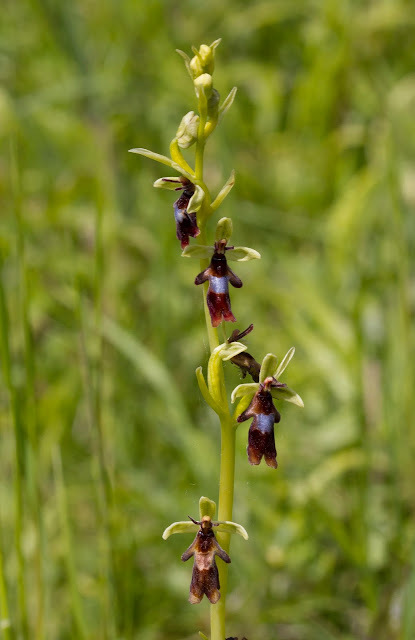 My knowledge of plants is very limited but we were lucky to bump into a very friendly botonist who gave us a mini tour of the highlights in the glade and just about everything he showed me I had never seen before. Lots of Military Orchids with Fly Orchids, Common Twayblade, Greater Butterfly Orchids and White Helleborine dotted around too. 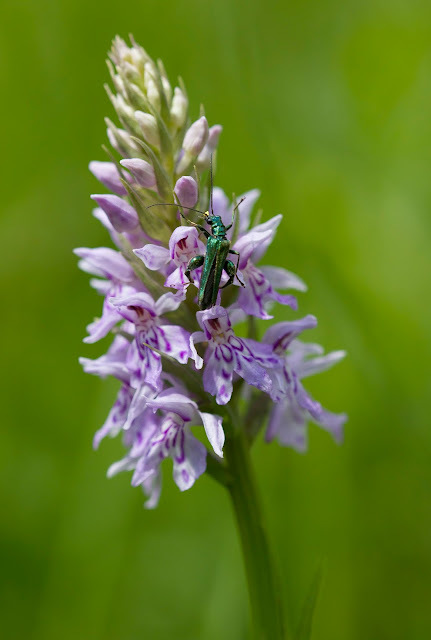 Another nice find was this Common Spotted Orchid with a Swollen-thighed Beetle clambering up it. 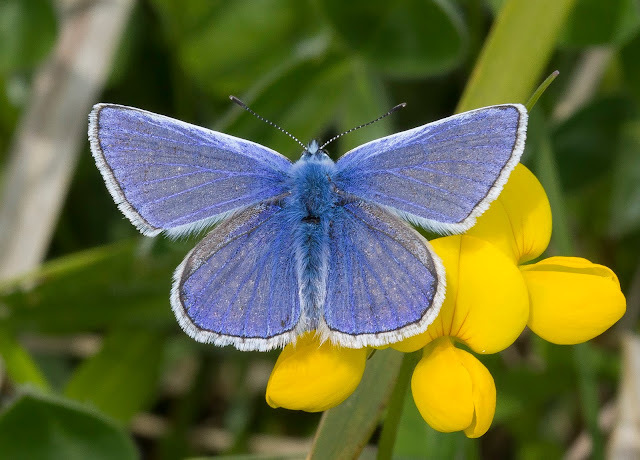 After enjoying this site for a while the sun came out and after looking at the map we realised we were only just round the corner from Yeosden Bank and as we'd heard the Adonis Blue was out there we decided to pop over for a look. We ended up finding quite a few Adonis Blues at the far end of the reserve and I'd forgotten just how hard they are to get pics of. They always seem to settle in amongst the grass so getting shots of them out in the open is difficult and to make matters worse the wind had now picked up but we carried on and eventually got some good shots. 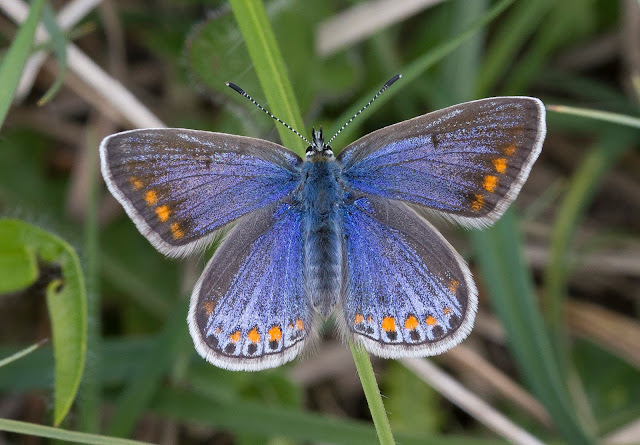 As we left Yeosden Bank Jon managed to find a stunning female Common Blue and the final photographs of the day were taken of that. It was a fitting end to a great day, we certainly seem to have had luck on our side. 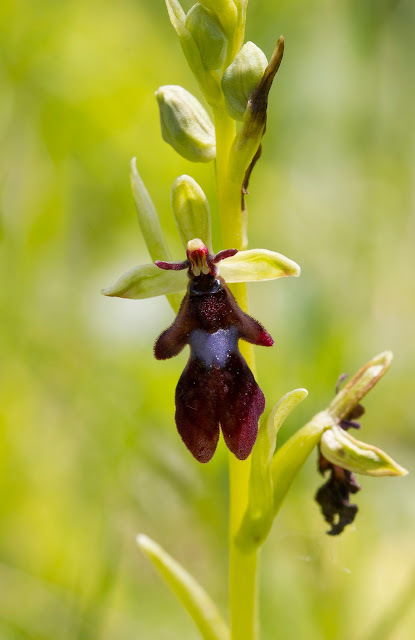 Also many congratulations if you are still reading as you have made it to the end of this rather large blog post, I'll try not to leave it so long next time!